Our scope of expertise covers everything from high end ornamental iron, structural steel, steel windows and doors, aluminum gates, stainless steel handrails, and cable railings to all misc. metal manufacturing. Here is a full list of the services we offer. We do all welding and shaping with our own skilled experts. In-house fabrication of structural steel for both residential and commercial construction and building. We have a 5’ x 10’ CNC plasma-cutter table to precision shape anything large or small out of steels and aluminum, which has dramatically increased our average production time. Uses CAD design. Great for manufacturing unique metalwork, signs, logos. Any degree of custom design – we work with people to deliver the highest quality possible. · Vehicle and pedestrian gates for driveways, walk-ways, estates and ranches. · Doors, windows, and window guards. · Hand-, guard-, and stair-railing. · Fencing, balcony fencing and full balconies. · Accents such as (but not limited to): curtain rods, finials, pickets, rings and other hardware, fire screens, vent registers, pot irons, mail boxes, and more. · Decorative and ornamental pieces for homes and businesses. 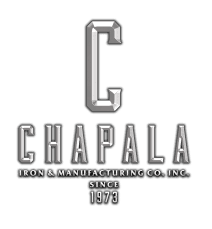 We offer a wide diversity of both hand and machine finishes for our steel and wrought iron. Epoxy prime and paint available for anything that we produce, with a variety of possible finishes. We also offer metallizing for our products; which is a [typically aluminum- or zinc-] metallic coating that greatly slows weathering and reduces corrosion from common factors such as salinity near the beach. Feel free to contact us about other metalwork you may need!